Burning Sands Golf Course is a Public, 9 hole golf course located in Empire, Nevada. Burning Sands Golf Course first opened for play in 1970. This course is privately owned by U.S. Gypsum Company. It's open to the public and there are no green fees, but they do take donations. This is a good practice course that features well-bunkered greens and narrow fairways. There is no pro shop. Burning Sands Golf Course plays to a maximum 9-hole distance of 2,007 yards and a par of 32. Heck, not just the course closed, the hole town closed. Since 1948, the United States Gypsum Corporation (USG), which is the nation's largest drywall manufacturer, has held title to all of Empire: four dusty streets lined with cottonwoods, elms, and silver poplars, dozens of low-slung houses, a community hall, a swimming pool, a cracked tennis court, and a nine-hole golf course called Burning Sands. The company also owns the town's drywall plant and the nearby gypsum quarry, a 264-acre gouge in the foot of the Selenite mountain range six miles to the south. 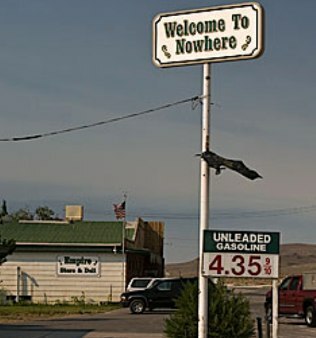 On June 20, 2011, Empire, Nevada transformed into a ghost town. An eight-foot chain-link fence crowned with barbed wire sealed off the 136-acre company town. Even the local ZIP Code, 89405, was discontinued.